I love to try new things when it comes to health and fitness. One of the benefits of attending the Arnold Classic Expo every year is you meet some great people and learn about companies you may have never heard of before. Sports Research was one of those companies for me. Their flag-ship product is something called Sweet Sweat. Talking with Vice President Jeff Pedersen and his family I quickly learned that sweet sweat wasn’t a new product but one used by everything from fighters,to actors to stay lean and mean. Watching the live demo of Sweet Sweat , I thought ” ok he is dripping but it has to be that stuff melting”. Then Came the IR camera , again ” He is heating up the goo of course it looks like it’s getting hot. There is not way that stuff is actually making the fatty areas hotter”. Curious as always and trusting my new friend Jeff, I grabbed a few Jars and decided to give it a shot. I took home the jar , applied it to my core area and started Les Mills Combat. 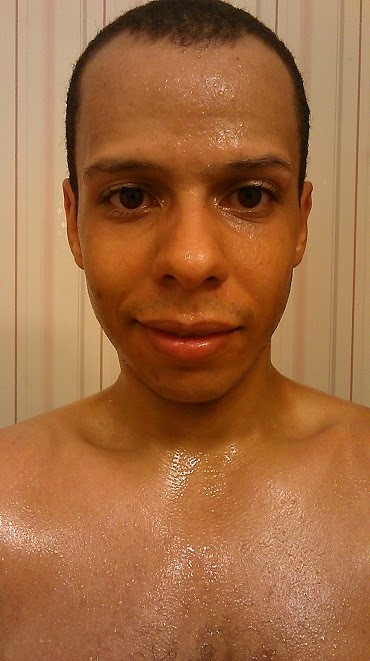 About 20 minutes in, where i am usually just starting to get a good sweat on, I was drenched. You would have thought i just stepped out of the pool. I completed the workout (60 mins or so) and could feel the heat coming off my lower back where i had applied Sweet Sweat. The Kicker – one month in I noticed a reduction in my stretch marks / loose skin on my stomach. Since that first trial run I have used it with Insanity, P90x2,Insanity the Asylum, FocusT25 and Running. All in all i am a fan of the product. It goes on pretty easy and does what they say it does. The only problem i have found with it so far is you have to kinda feel your way through what the right amount is for your needs. An XL jar can last me 3 – 6 months depending on how often i Train. Cardio days I apply pretty much every where, strength days I apply it to the muscle group I am working on. Hope you found this review of Sweet Sweat Workout Enhancer helpful.